The Green Oak Carpentry Company has just completed this frame assembly at Grindstone Mill in Gloucestershire. 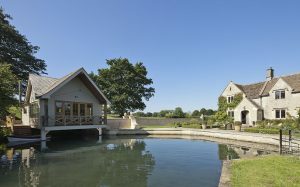 Situated in the beautiful Cotswolds near Alderley this boat house will create a fun ‘camping out’ space and area for al fresco eating for the family. The Green Oak Carpentry Company completed both the Oak frame and the soft wood cut and pitch leaving site ready for the roofer to commence putting on the Cedar Shingle roof. 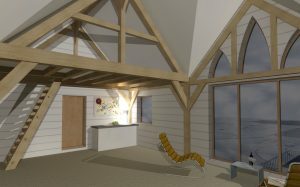 The 3D model below is a normal part of the design process for most Green Oak Carpentry frames enabling the client to see at a glance the style and scope of structure being supplied. The whole frame sits onto a steel structure set onto piled footing in the mill pond. By setting the footing well back from the perimeter of the building the structure will when complete, appear to float over the water. The deck on the waters edge has a St Andrew’s cross balustrade all fully jointed into the structure as part of our scope of works. In this case steel work is galvanised and painted black for a more traditional appearance. The elevations will be clad in fresh sawn oak weatherboarding and when all is complete we will bring you pictures of the finished building.